Mayko is going to copy some drawings by Lautrec, an artist with a distinctive style, and try to learn from the experience. You can either watch the video or we have written it out below. There’s understanding that happens in your conscious mind, which comes from taking in information, and then there’s understanding that happens in your eye as you observe and in your arm as you draw, and that comes from the act of drawing. So Mayko’s going to recreate some of his drawings, and hopefully find out what it is about his artwork that she loves and what we can take away from it for own drawing. She chose these two figures, each done in different styles. Lautrec’s one of her favourite artists of all time. To her, he’s a pioneer of a modern style of drawing. She loves his focus on lines. Up to this point, a lot of Western painting was focused on nuanced and subtle gradations of tone. Lautrec kept tones relatively flat – a little bit more graphic – but his drawings are full of life and energy because of his lines. They are free flowing, tender and subtle. 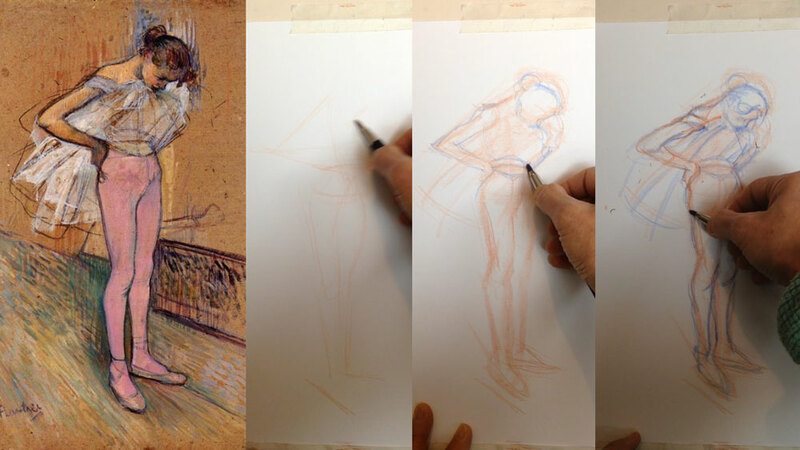 To try to recreate Lautrec’s lines, you can’t just try to copy them with accuracy. You need to match the physicality of his drawing. 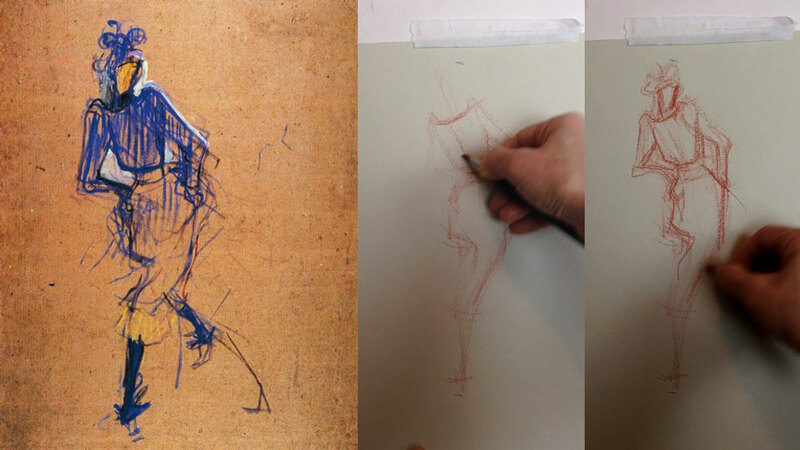 Drawing is not just about analysis, it’s a physical activity. 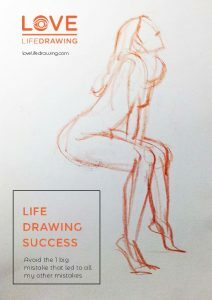 That’s why often life drawing classes start with warm ups. You need to get the rhythm going, get your arm moving and your eye seeing like athletes getting ready for a game. Then, while drawing, you want to vary the tempo, a bit like how a good public speaker doesn’t just think about the words they say, but also about the delivery. They don’t speak in a monotone fashion, they mix up the intonation and emphasis and pitch, and that’s almost more important to moving people than the content of the speech. Imagine if Winston Churchill had delivered his speeches without any passion – even with the same words, they’d lose all their power. Trying to draw like Lautrec really requires matching his tempo. 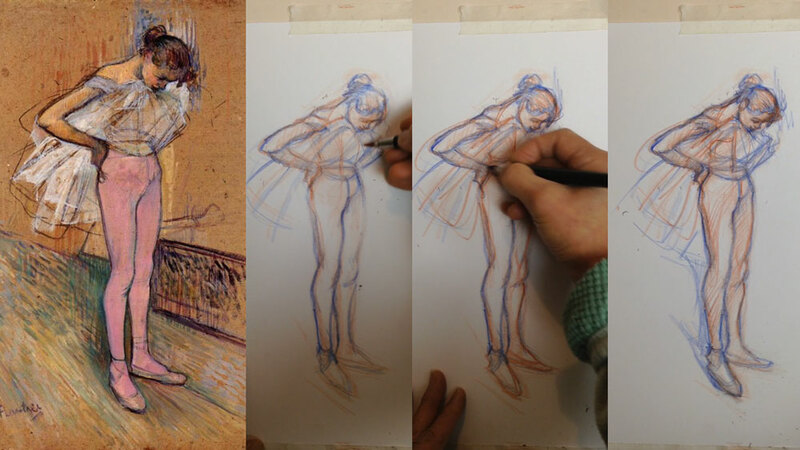 In that regard, there are similarities between how he draws and the dancers in the drawings. Now, we don’t really know the order in which he drew the lines, but we can try to recreate what we feel he was doing in the drawing. That investigative process is going to teach us a lot. 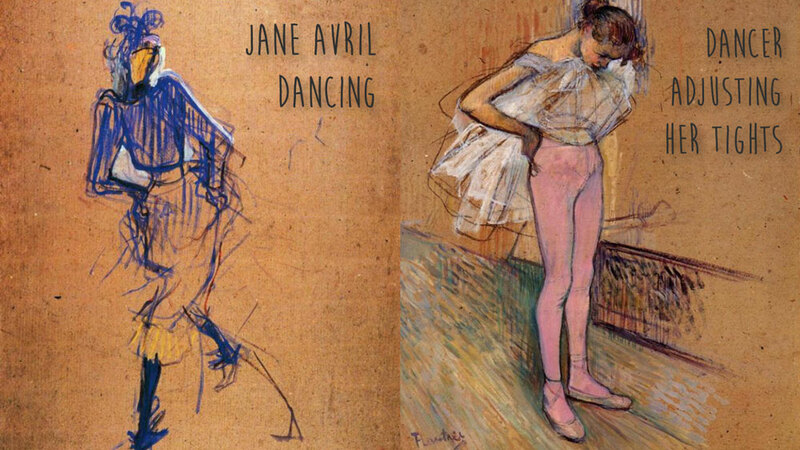 This drawing of Jane Avril is all movement – the structure and everything else is there but it’s all about the movement. He may even have observed and drawn her while she danced and actually moved, and seen the figure from both sides when drawing this. Most of Lautrec’s oil paintings use oil paint that is diluted a lot with turp and painted on cardboard, which would absorb the diluted paint quickly so it dried quickly. Used this way, it becomes a bit like watercolour, but with more viscosity so the painting has more body. 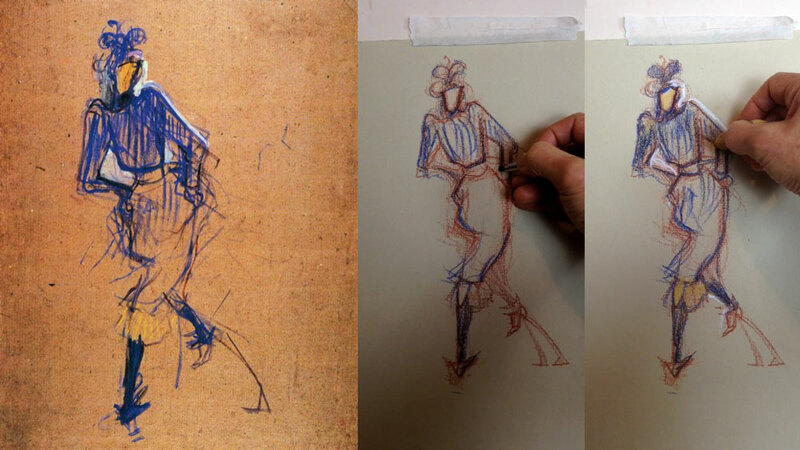 The dancer drawing is an extremely natural pose – it doesn’t look like an artificial pose. It’s a simple pose, but there are important subtleties. There is that tension in her neck and chin, the feeling of concentration. One of his great achievements is creating drawings that feel like real moments. Of course he had skill and technique, but also knew how to be engaged with that moment, and to allow his instinct and feeling to be in charge of the drawing – using technique as a tool rather than letting it dictate the whole drawing. 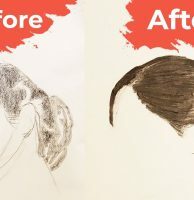 While you’re learning, you feel like your drawings are nothing like you hoped, so you want to control the outcome more. 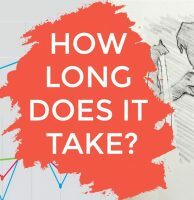 Learning technique and gaining knowledge, like anatomy and measurement, makes you feel like you can control the outcome more, which is great, but another skill to learn is letting go of that desire for control and letting things flow. This ability meant Lautrec could capture figures like there is real energy in them, real tension and force. He can capture a moment – not just accurately, but with humanity and mood too. Lautrec liked Japanese ukiyo-e (Hokusai’s ‘The Great Wave’ is an example of ukiyo-e). 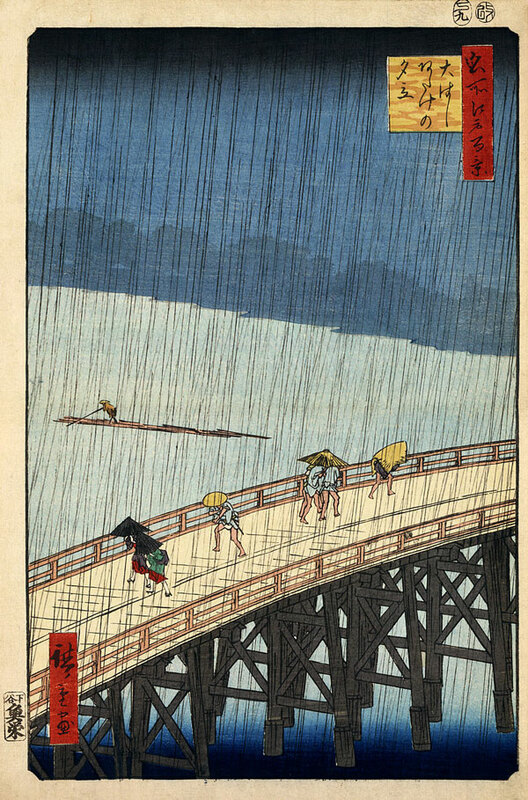 They’re woodblock prints, which keep colours very flat with outlines. 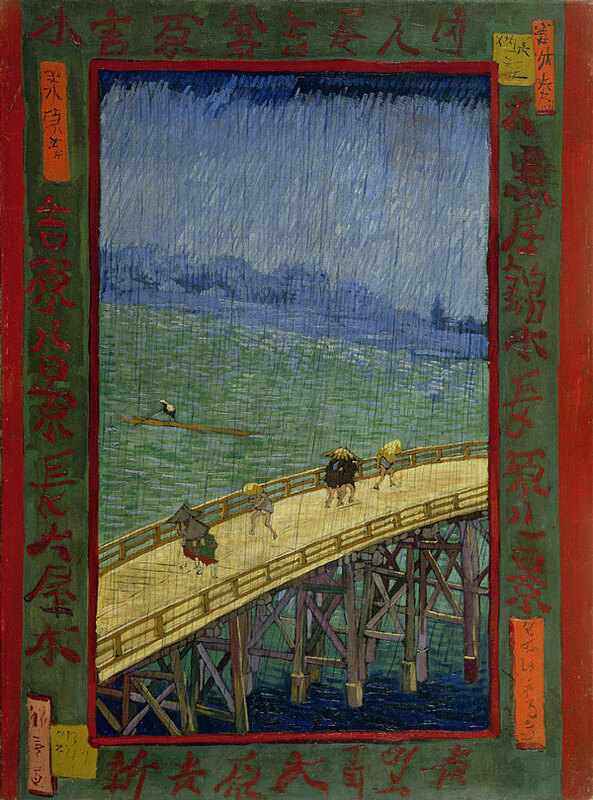 Another artist influenced by ukiyo-e was Van Gogh. 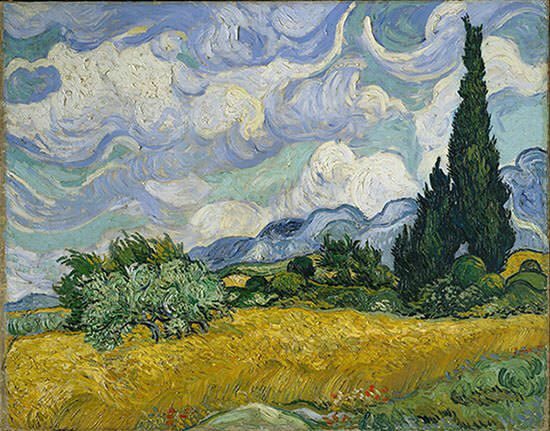 Van Gogh was another pioneer of a modern style of art. He was very different to Lautrec, using very heavy oil straight from the tube without dilution. His work is also very physical, but instead of sophisticated lines, he pushed thick paint. Lautrec’s artwork was a natural and tender treatment of the subjects, his subtle use of lines feels like a dance. Van Gogh’s paintings feel more forceful. Like Lautrec he also used strong contrast and lines, but his lines were less fluent than Lautrec’s. They had power in their jerkiness, and then he also added power in his tones. So when try drawing like artists you like not just by analysing and matching the lines exactly, but also by matching the force, tempo, rhythm of their lines. 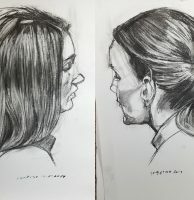 And when drawing yourself, consider not just the proportions, the accuracy and technical things like that, but also the rhythm in the lines – is the drawing delivered with passion and power like Van Gogh and Winston Churchill, with tenderness and subtlety like Lautrec? 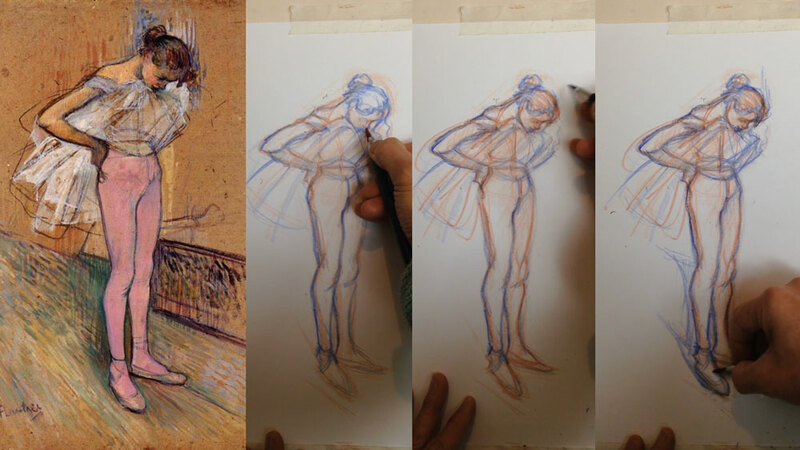 If you enjoyed this article, check out our video/article on Degas’ pastel hatching technique. If you haven’t signed up already, give our newsletter below a try – useful tips and motivation sent to your inbox every week or two.